The important part first. The bike was ridden around the block on April, 16, 2012. Really. January 2010 we got some mail from Australia. Someone else was working on a pair of similar bikes. So there has been some email and pictures sent and this did really encourage to work on the Tohatsu, again. It had been several years since any work on the Tohatsu. We had thought that we had put somewhere safe some parts and were looking for them. When fixing the bike, it was found that those parts were not relly missing (though, some others were. A lot was learned from Phil in Australia. There is scan of a sales brochure and pictures of his bikes in before and after states. As there has been work and progress on the Formula Juniors (but no web site updates) there was a story in the Formula Junior Historic Racing magazine. Here is A Tale of Two Bikes. Now, that things look a lot better, there has been added another Tohatsu. 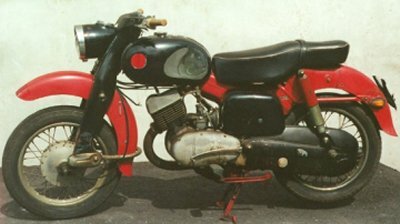 This is a 125 c. 1957 . The frame number is LA-5001. Is it the first LA-5 or the five thousand and first of LA. 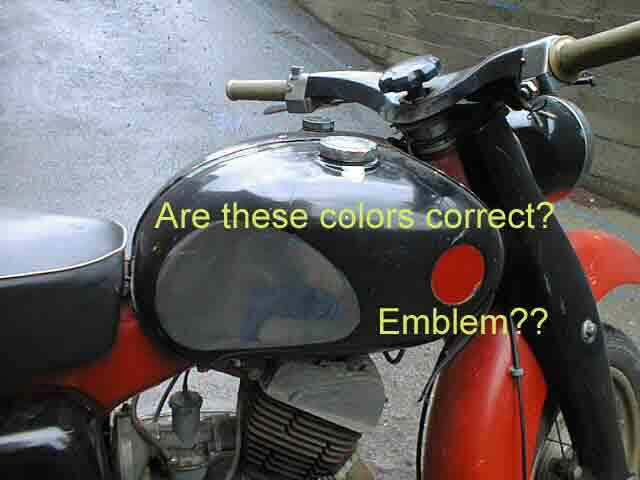 Or did they just start numbering at 5000 to make people think this is a more popular bike than it actually is. Latest news (well latest 8 years ago) . The bike is now under restoration. This bike was originally purchased by a US serviceman stationed in Japan. The front plate is US Army Pearl Harbour plate. The compression is good. Chrome and paint as one would expect from a 40 year old bike.